Sweet Potato Brownie Fudge is a simple recipe with just two ingredients: brownie mix and sweet potato (or pumpkin) puree. The resulting fudge bites are dense, dark chocolatey squares that are low-calorie and low-guilt. While perhaps not technically a candy, these squares are so similar to fudge in taste and texture, it'd be a shame not to share them. Preheat the oven to 350 degrees F/175 Celsius. In a large bowl, combine the brownie mix with the sweet potato puree. Stir until it's well-mixed. It will be very dry at first, but keep stirring and everything will become incorporated into a thick batter. Scrape the batter into the prepared pan and bake for 35 minutes, or until the brownie fudge is barely set. When you tap it with your fingers it should be soft and move a little, but should be mostly set and not have a raw shine. Let the pan cool to room temperature, then refrigerate it to set the brownie fudge, for at least 2 hours. Once set, peel the foil back from the candy and cut it into small squares to serve. 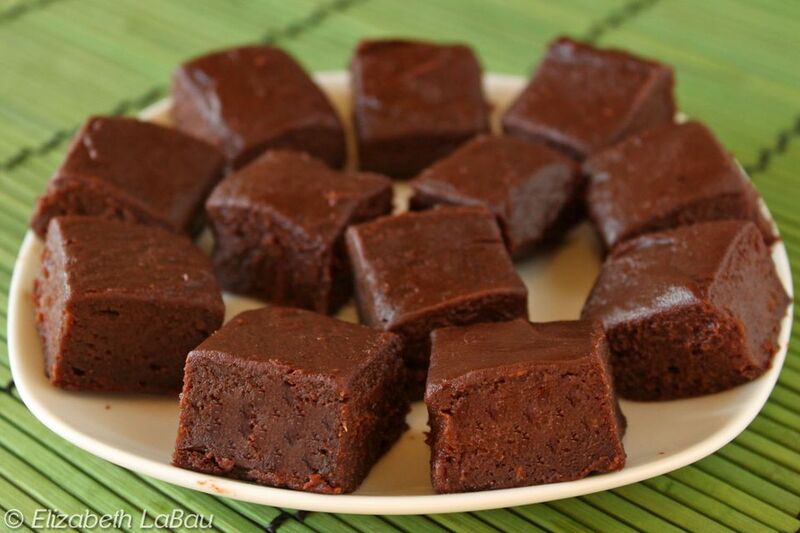 Sweet Potato Brownie Fudge can be stored for up to a week in an airtight container in the refrigerator. The pieces might become too soft if left for an extended period of time at warm room temperature.